THE ‘goals win matches’ cliche held true at Kingspan/Breffni Park last night as Tyrone U21s achieved their goal in workmanlike fashion. Two clinically-executed goals gave the reigning All-Ireland U21 football champions a deserved if nervy win in perfect conditions. The seasonal weather provided the backdrop to a turbo-charged tie which only took a breather at the half-time break. Crucially, the O’Neill county were far more efficient in the last third of the field with Cavan posting 16 wides to their opponents’ eight over the hour-plus. Sadly for the purists present, blankets of a white and blue hue were de rigueur, leaving goal chances as rare as the sound of the corncrake in Cavan. Claustrophobia was the name of the game with the business ends of the grounds resembling O’Connell Street on St Patrick’s Day for the most part as both teams consistently posted 12 of their number inside their own 45-metre lines. Cavan dominated the opening 10 minutes, but their proflicacy early on would let their opponents off the hook, time and time again. Indeed, for all their possession, the Blues were thankful for two long-range frees from goalkeeper Liam Brady which helped ease them into a 0-3 to 0-0 lead. The hosts played second fiddle to their fired-up opponents for the rest of the first half though and two textbook points from Cathal McShane tied the scores (0-4 apiece) for the first time with 21 minutes on the clock. 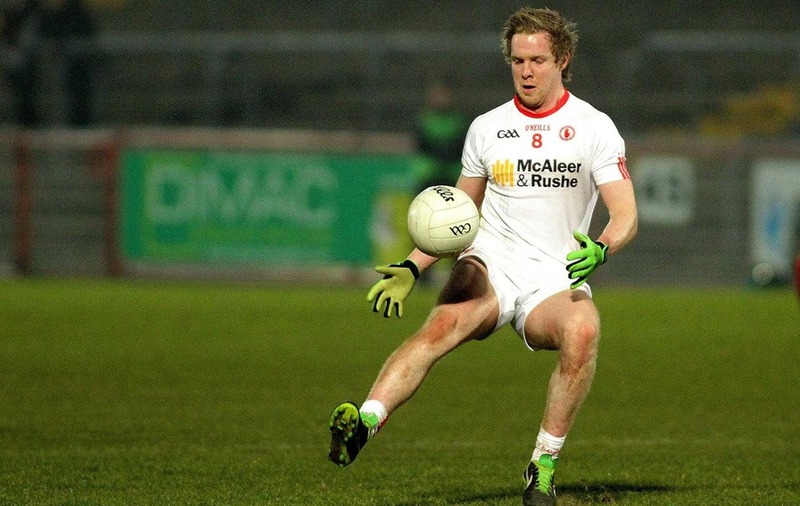 McShane, one of four survivors from Tyrone’s 2015 all-Ireland final starting line-up, was the stand-out player in the opening half and his fourth point hoised his side into a 0-6 to 0-5 interval lead. The decent-sized crowd had to wait ‘till the 40th minute for the first goal chance but Mattie McKenna dived to block McShane’s close-range effort only for Brennan to convert the subsequent ’45. 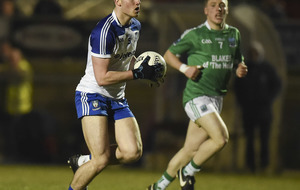 Cavan were too shot shy for their own good and their failure to bring go-to guy David Brady (on the edge of the square) proved fatal as their goal-hunting exploits proved fruitless. The contest was chess-like throughout but Tyrone always looked more likely to cut through for the all-imporant goal(s). And that’s how it panned out in the second half with Tyrone’s speed of the mark and running off the shoulder much superior to their opponents. 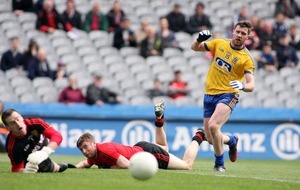 The blues were finally made to pay for their wastefulness when galloping half-back Colm Byrne goaled from point blank range in the 48th minute after Frank Burns steamed through the heart of the Cavan defence. 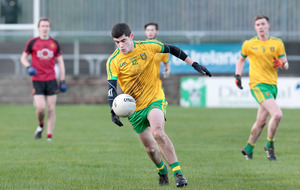 Burns' belter propelled the Red Hand county into a 1-8 to 0-7 lead but worse was to follow for the hosts when Ben McDonnell netted four minutes from time after an incisive pass from Burns. Cavan emptied the bench in a bid to pull the fat from the fire. On a night of unfulfilled aspirations though for Niall Lynch’s side, their woes were cemented in the dregs of the game when they were unable to replace the black carded Cormac Daly in the 56th minute having used all their subs. Cavan: L Brady (0-3 frees); M Magee (0-1), B O’Connell, B Fortune; C Bradley, B Kelly, N Clerkin (0-1); K Monaghan, M McKenna; P Corrigan, L Galligan (0-2), P Smith (0-1); D Brady, T Hayes (0-2, 0-1 free), C Daly; Subs: D Monaghan for B Kelly (h-t); O Carolan for P Corrigan (35); B Magee for C Monaghan (42); D Wilson for C Bradley (47); J Doyle for L Galligan (49); T Galligan for P Smith (54). 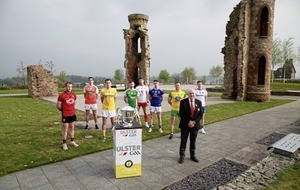 Tyrone: S Fox; C McCann, P Teague, S Hamill; C Byrne (1-0), S Loughran, P McGirr (0-1); C McShane (0-5, 0-1 free), B McDonnell (1-0); M Kavanagh (0-1), F Burns, M O’Neill; L Brennan (0-2, 0-1 free, 0-1 45), R Loughran, S Fox; Subs: D Gallagher for P McGirr (25); R Coleman (0-1) for R Loughman (38); D Lowe for S Fox (52); E Murray for C Byrne (56); R McGlone for M O’Neill (59); S O’Donnell for F Burns (B.C 59).